Last night at 11:22 my new grandchild was born. She weighed in at a whopping 5 lbs 7 oz and is 17 1/2 " long. She is definitely a little peanut. She joins her brother who is 9 and her sister who is 6. I am not allowed to travel down there for at least another week, but can't wait to get there. My mom and I will be so excited to get there and give her lots of snuggles. So welcome to the world Tessa Kathleen. We are so happy that you are here. Congratulations, I know you must be excited to get and give some snuggles. Congratulations!!! Oh, what a blessing! She is just beautiful! kiss kiss....hug hug....she's a little snuggle bug ! Congratulations!!! She is precious, and I love her name! :D My baby is fifteen today! I know you are chomping at the bit to get down there! Congratulations! What a precious picture. :-) Welcome to this little one! Congratulations! She is a beautiful little bundle with a pretty name too! Congratulations to all of you, Laura! Hoping your chance to snuggle with that little princess comes quickly. What a little sweetheart! I know you're chomping at the bit to get to her!! God bless! She is a doll! What a bright eyed cutie! I love the name Tessa. It will fit her to a "T". Look for me in the back seat ;>) Blessings to grandma and the great grandmother also. Congrats on this precious adorable cute little thing! YAY Laura! I hope mum and baby are doing great! Congrats. What a beautiful baby!! I'm sure you are anxious to hold her, and to see her big brother and big sister, too! She is a darling button. Congrats Grann and to little family. 9, 6 and new, quite a spread for them. Best to all. Congrats!! She is so cute and so very tiny. I forget when they are that tiny the are so adorable. Congratulations! She looks a little unsure about this whole being born thing. What a cutie pie! Congrats!!! 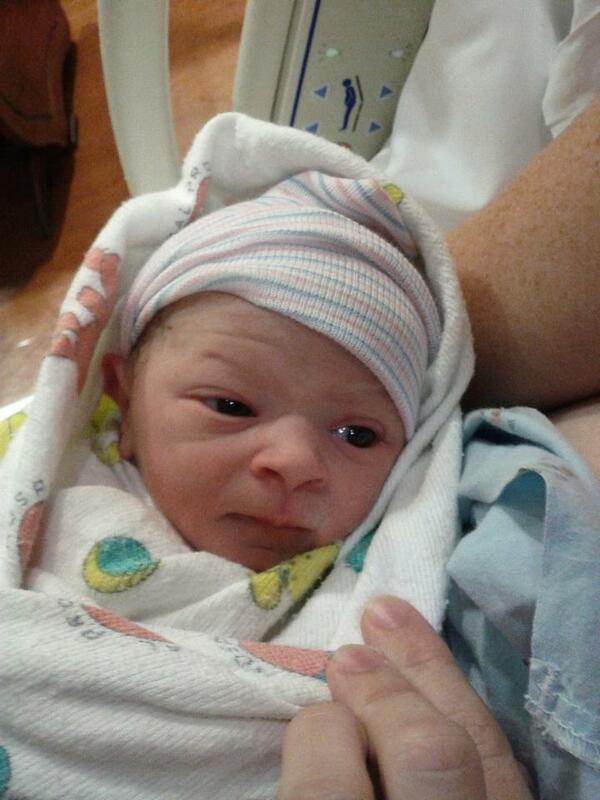 Your new Grandbaby is beautiful!!!! Congratulations! May she bring many new smiles and a lot of happiness into your life!